Amidst the ongoing brouhaha on Nigerian social media regarding the arrest of controversial bleaching expert, cross-dresser and alleged homosexual, Idris Okunneye popularly known as Bobrisky, the international community is gradually showing interest. A popular white comedian named Ellen Baby has shown her support for Bobrisky who is currently in police custody for unclear reasons. Ellen took to her instagram page with close to 200k followers too display the hastag#freebobrisky and pen her opinion. "I know I am not very active these days, but I want to show my support to someone I admire. God knows you are a strong human being. To be yourself in a society that have been telling you that you are wrong for being who you really are, shows that you have more strength than most of us! You bring hope to many that are in the same situation but are scared of living freely because they are scared of being disowned, mocked, losing their support in whatever business and brand they have and becoming an outkast! I know that many people love you, but are scared to support you in public because they do not want to damage their own brand! You go through bullying and mocking every day of the week but you manage to stay strong! You have to see your pictures and videos reposted all over the internet with negative and degrading captions and still you continue to smile. That is in my eyes admirable. You bring smiles to many People's faces, and ur happiness is contagious! Even if I do not support urbusiness and the bleaching industry I still admire you as a person! Keep on doing you, do not let them break you! You are an example for all of us! This is 2017! Who are we to to judge? Who are we to mock, bully and speak down to other? Imagine not being able to be who you are because of fear and judgement! God forbid! I will pray for your safe return! 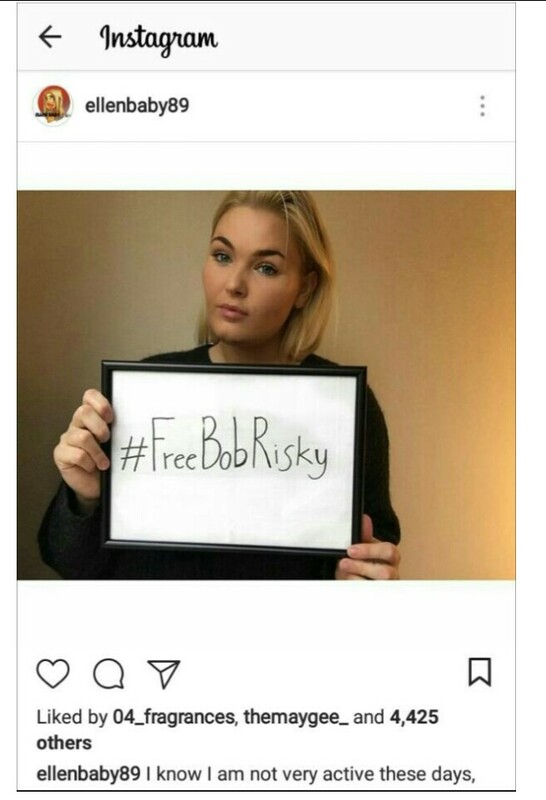 #FreeBobRisky ???? - And to anyone cursing me here, telling me I am wrong, telling me they won't support me, speaking negatively, let me remind you something. Ur opinion does not matter to me. This is not my livelihood. You do not pay my rent. You unfollowing me or hating me will not affect my life. Let me remind you once again that you should go out and enjoy being alive and preach love and happiness instead of commenting negative words in here that do not matter to me or my life"
Her post has now attracted close to a thousand comments from foreigners who are fully in support of freeing Bobrisky.